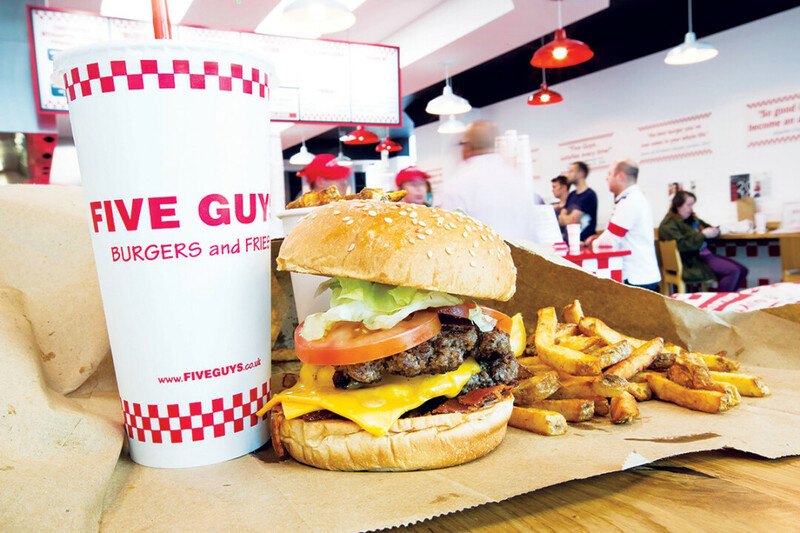 Five Guys, the nationally renowned burger chain, is coming to the Oakwood Mall in Eau Claire in mid-April. The burger joint will offer a large variety of burgers, fries, soda, and hot dogs, sandwiches including BLTs and grilled cheese, and milkshakes. All food at Five Guys is made when ordered, with the option to customize by choosing from 15 free topping choices. The chain is set apart from other burger joints because everything is made fresh, and never frozen. “Everything is prepped fresh the day of service from our burgers being balls to potatoes being cut. No freezers,” said Amy Van Vickle, Director of Operations for Credo, LLC, a franchisee. The most popular menu items are the bacon cheeseburger, Cajun fries, and a chocolate shake, according to Van Vickle. The Eau Claire Five Guys – which will have an exterior entrance near Younkers – is hiring in anticipation of its grand opening. They will bring on a management team of four to five people and 40 local employees to work at the restaurant. To join the team or learn more about the restaurant (including the grand opening date) check out facebook.com/fiveguyseauclaire.